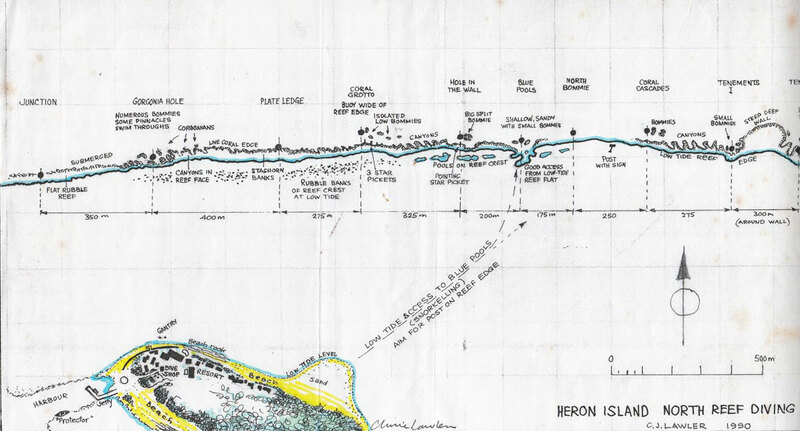 Most of the dive sites at Heron Island are located on the eastern side of the fringing reef that surrounds Heron. Blue Pools and North Bommie are sites located about half way to the southern end of the eastern reef. This dive was my 100th dive and I did it on my trip to Heron Island in October 1989 for the Heron Island Dive Festival. Blue Pools is the more north dive site and is roughly east of the northern end of Heron Island (but straight opposite the middle as you look out from the island). Blue Pools has a mooring that is on top of or near a small bommie. This is one of three bommies that are in a small bay that gives the site its name. The bay is very shallow, only six metres or so and normally very clear. Once on the bottom you explore the bommies and the bay before heading out a little deeper. Once out of the bay, turn right and drift with the current along the bottom of the wall. This is only about nine metres or so. The bottom is composed of sand with a few small coral outcrops. There are a couple of small indents or bays in the wall and these should be examined. Just past the second indent you should be able to see a large bommie off the wall about 20 metres. This is North Bommie. It is about 18 metres at the bottom and I would suggest circling it a few times before heading back to the wall. The mooring is located on one of two smaller bommies that are in a bay opposite the main bommie. This bay and the two bommies are also worth looking at. On this dive I saw stingrays, turtles, anemones and clownfish as well as all the usual reef fish. I also wrote in my log book that I saw a garden gnome. For the life of me, I cannot remember where this was on the dive, but I do still recall seeing it almost 20 years after as I write this article. This is a nice dive, but not as good as some others nearby.